Some of our favorite recipes. Star Fish Market carries many of the grocery ingredients too! Season Ahi Tuna with salt and pepper. Heat one tablespoon of olive oil in a skillet until hot but not smoking. Sear tuna to desired doneness. Cook quinoa according to package directions. 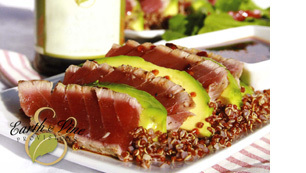 Slice and layer avocado and tuna on bed of quinoa. Drizzle with Chili Ponzu Dipping Sauce. East meets West in this savory citrus-laden condiment sauce. Fragrant California orange zest is blended with spicy chilies, piquant rice vinegar and slow-brewed soy sauce. Resulting in a sauce that's a natural to dip sushi or tempura, pour over soba noodles, sweet sticky pearl rice or chicken satay. Enhance and Pacific Rim dish and awaken the senses. 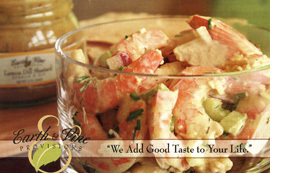 Mix together salmon, pretzels or crackers, 1/2 cup Key Lime Kiwi Tangerine Marinade, mayonnaise and garlic. For 8 even sized patties. Mix salt and pepper into flour in a shallow dish. Heat oil in medium sized skillet over medium heat. Coat salmon cakes lightly on each side in flour mixture. Place 4 salmon cakes at a time in the skillet and cook on each side until browned (about 2 minutes per side). 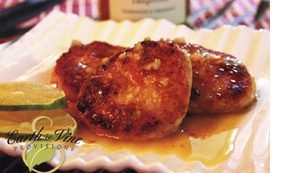 Serve hot with extra Key Lime Kiwi Tangerine Marinade and garnish with sliced kiwi. Brush salmon and vegetables with oil. On a hot grill, grill salmon and vegetables until done. Cut bell peppers and zucchini halves into thick strips. 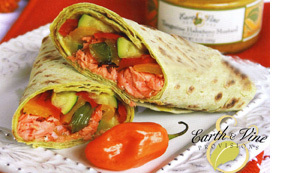 Brush each Lavosh wrap with 1 1/2 tablespoons of Tangerine Habañero Mustard and divide salmon and vegetables evenly among wraps. Roll up wraps and serve. In a medium sized skillet heat oil over medium heat, cook fish until fish becomes flaky. Season with salt and pepper and remove skillet from heat. Warm tortillas over flame. 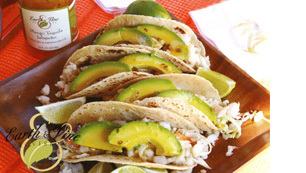 Place warm tortillas on plates and fill each with fourth of the shredded cabbage and fish. Top with two slices of avocado per taco and drizzle with Mango Tequila Jalapeño Grilling & Dipping Sauce and hot sauce to taste. Serves 2. Double recipe as needed for more people. Mix all ingredients together and serve with flat bread as an appetizer or side dish. Season lamb chops with Herbs de Provence. Grill or broil lamb chops to desired doneness. Whisk together Meyer Lemon Rosemary Marinade & Dressing, extra virigin olive oil, garlic and salt. 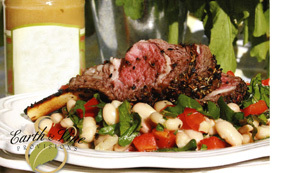 In a medium bowl add beans, arugula, bell pepper, and oregano. Toss with dressing, plate and top with lamb chops. Copyright © 2011-13. All rights reserved.